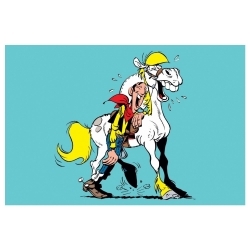 Lucky Luke There are 136 products. 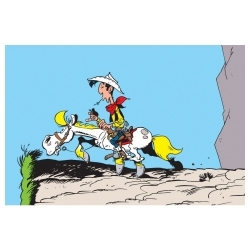 Nice Pixi scene based on the classic cartoons and comics about Lucky Luke: The diligence. 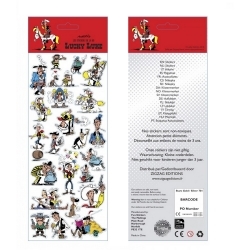 Limited numbered edition, 130 copies with certificate of authenticity. 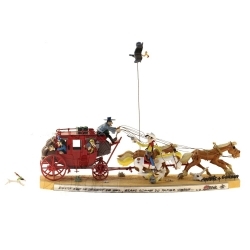 Handpainted metal figures on wooden base. Dimensions: 42x17cm. 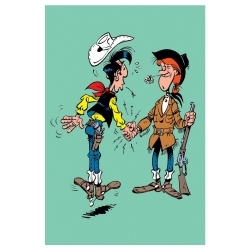 Postcard Lucky Luke collection: Dalton & Rantanplan. 15x10cm. 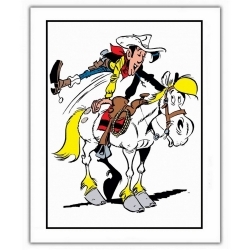 Postcard Lucky Luke collection: Lucky Luke lifting Jolly Jumper. 10x15cm. 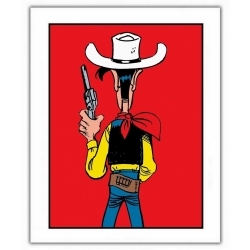 Postcard Lucky Luke collection: Ready to shoot. 10x15cm. 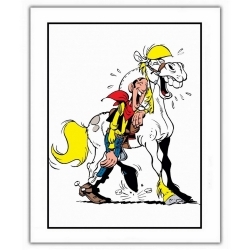 This Lucky Luke collectible metal sign will raise even the most modest library to the heights of chic! 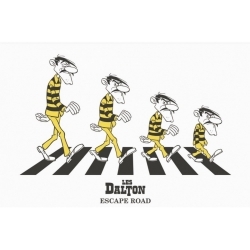 Dalton Brothers Escape Road. 30x20cm. 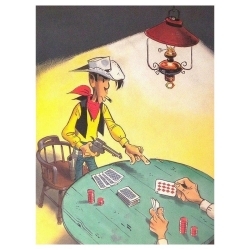 Poster offset Lucky Luke collection: Lucky Luke Poker. 28x35,5cm. 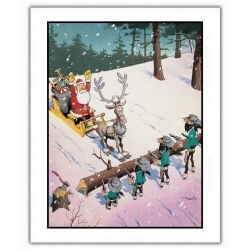 Poster offset Lucky Luke collection: The Daltons stealing Santa. 28x35,5cm. 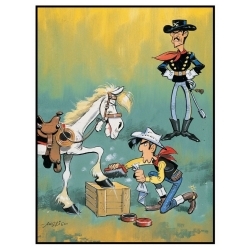 Poster offset Lucky Luke collection: waxing the hooves of Jolly Jumper. 28x35,5cm. 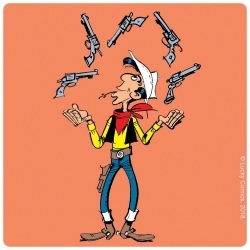 Poster offset Lucky Luke collection: Shooting positions. 28x35,5cm. 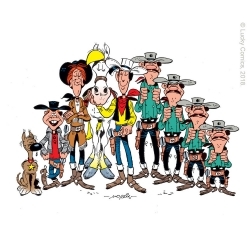 Poster offset Lucky Luke collection: Characters. 35,5x28cm. 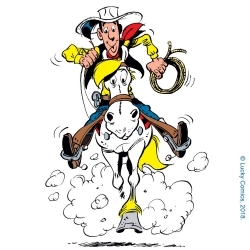 Poster offset Lucky Luke collection: Jumping in Jolly Jumper. 28x35,5cm. 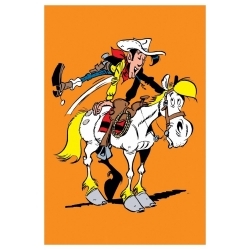 Poster offset Lucky Luke collection: Lucky Luke & Jolly Jumper. 28x35,5cm. 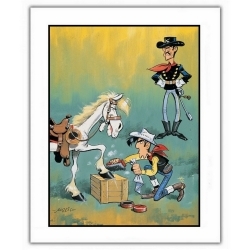 Poster offset Lucky Luke collection: Rantanplan. 35,5x28cm. 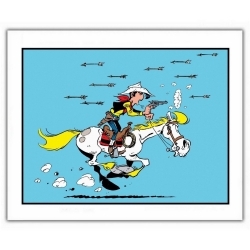 Poster offset Lucky Luke collection: Attacked with Indian arrows. 35,5x28cm. 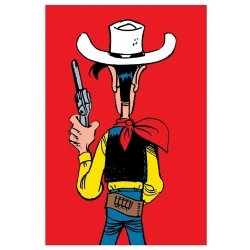 Poster offset Lucky Luke collection: Ready to shoot. 28x35,5cm. 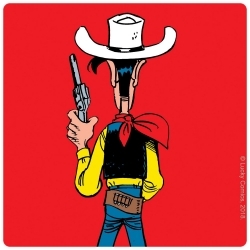 An absolute must-have for all fans of Lucky Luke. 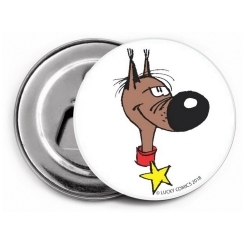 The cork-backed coaster has a laminated image on the top. It is original, functional and eco-friendly. The coaster is not only looking great on your table but it will also protect your table from heat, stains and spillages. Ma Dalton knitting (10x10cm). 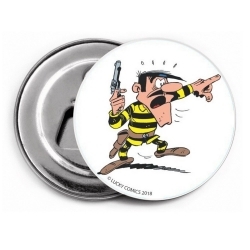 An absolute must-have for all fans of Lucky Luke. The cork-backed coaster has a laminated image on the top. 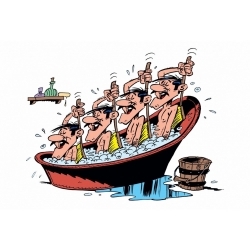 It is original, functional and eco-friendly. The coaster is not only looking great on your table but it will also protect your table from heat, stains and spillages. 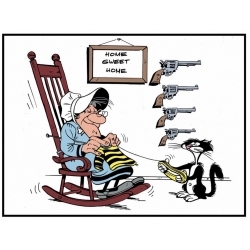 Ready to shoot (10x10cm). 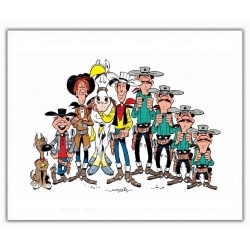 An absolute must-have for all fans of Lucky Luke. The cork-backed coaster has a laminated image on the top. It is original, functional and eco-friendly. The coaster is not only looking great on your table but it will also protect your table from heat, stains and spillages. 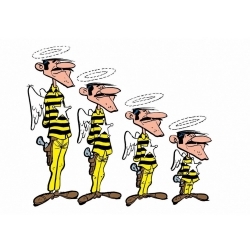 Characters (10x10cm). 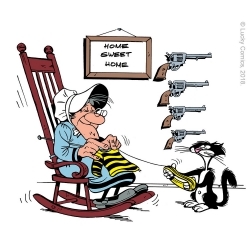 An absolute must-have for all fans of Lucky Luke. The cork-backed coaster has a laminated image on the top. It is original, functional and eco-friendly. The coaster is not only looking great on your table but it will also protect your table from heat, stains and spillages. 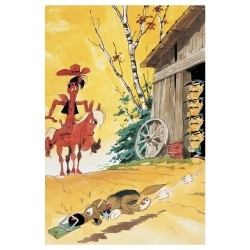 Dalton Brothers Escape Road (10x10cm). 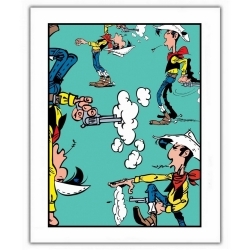 An absolute must-have for all fans of Lucky Luke. The cork-backed coaster has a laminated image on the top. It is original, functional and eco-friendly. 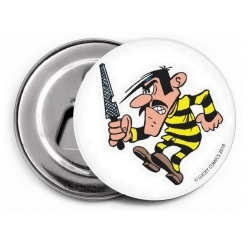 The coaster is not only looking great on your table but it will also protect your table from heat, stains and spillages. 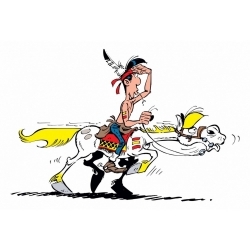 Galloping (10x10cm). 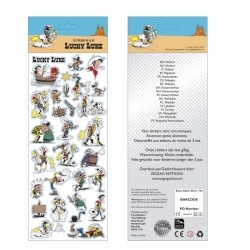 An absolute must-have for all fans of Lucky Luke. 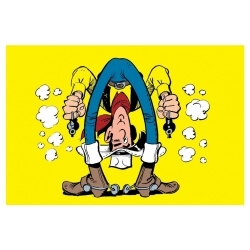 The cork-backed coaster has a laminated image on the top. It is original, functional and eco-friendly. The coaster is not only looking great on your table but it will also protect your table from heat, stains and spillages. 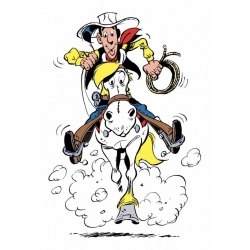 Un cowboy à Paris (10x10cm). 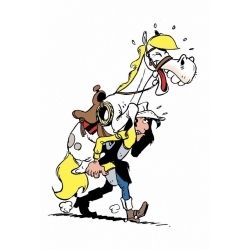 An absolute must-have for all fans of Lucky Luke. The cork-backed coaster has a laminated image on the top. It is original, functional and eco-friendly. 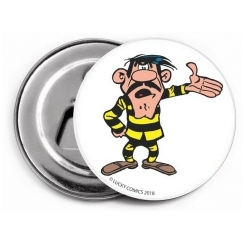 The coaster is not only looking great on your table but it will also protect your table from heat, stains and spillages. 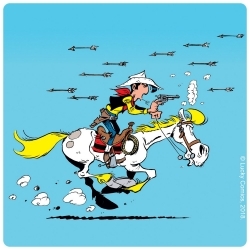 Attacked with arrows (10x10cm). 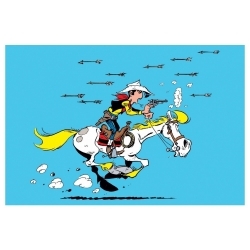 An absolute must-have for all fans of Lucky Luke. The cork-backed coaster has a laminated image on the top. It is original, functional and eco-friendly. The coaster is not only looking great on your table but it will also protect your table from heat, stains and spillages. 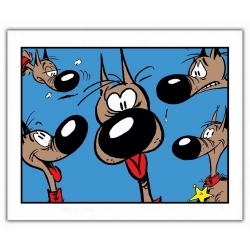 Rantanplan (10x10cm). 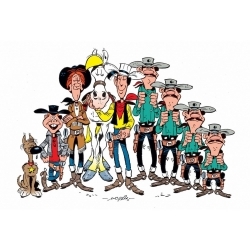 An absolute must-have for all fans of Lucky Luke. The cork-backed coaster has a laminated image on the top. It is original, functional and eco-friendly. The coaster is not only looking great on your table but it will also protect your table from heat, stains and spillages. 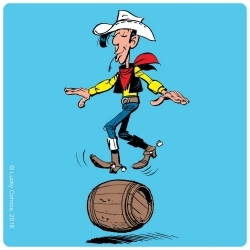 Balancing in a barrel (10x10cm). 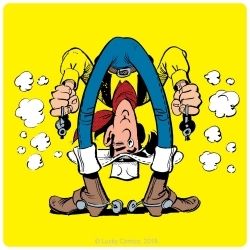 An absolute must-have for all fans of Lucky Luke. The cork-backed coaster has a laminated image on the top. It is original, functional and eco-friendly. The coaster is not only looking great on your table but it will also protect your table from heat, stains and spillages. 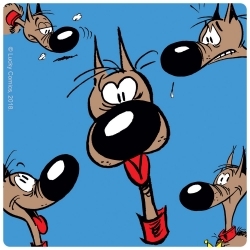 Juggle (10x10cm). 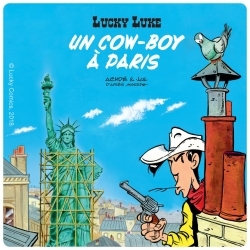 An absolute must-have for all fans of Lucky Luke. The cork-backed coaster has a laminated image on the top. It is original, functional and eco-friendly. 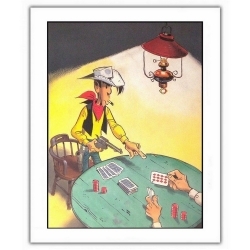 The coaster is not only looking great on your table but it will also protect your table from heat, stains and spillages. 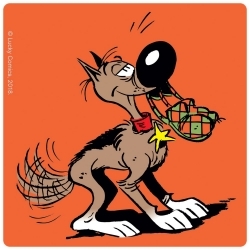 Rantanplan biting a shoe (10x10cm).